Lambda Chi Alpha Graduation Cords are a triple cord featuring the colors purple, green and Antique Gold. Purple, green and Antique Gold cords from Honors Graduation are made from high quality rayon and are 70 inches in length including tassels. The graduation cord is made up of three seprate cords tied together in the middle: a purple cord, a green cord, and an antique gold cord. Just like the Lambda Chi Alpha Graduation Cord from the Herff Jones online Greek store our cord is purple, green and antique gold triple tied. It is also the same legth (65 inches from one end to the other includeing tassels). There is where the differnces stop, however. The biggest difference is that Lambda Chi Alpha Cords ordered with Herff Jones will take anywhere from 2 to 6 weeks before they even ship the cord. At Honors Graduation we ship all orders recieved by 3:00 pm Mountain Time the same day, and all orders recieved after that go out the next day. If you use our slowest shipping method, the $4 flat rate shipping, you will recieve your purple, green and antique gold cords in just 4-6 days. Unlike hjgreek, we also have faster shipping options availible if you need your cords in a hurry. Lambda Chi Alpha is a fraternity, or greek letter organization (GLO), founded at Boston University in 1909. Though that was 100 years ago, it is the most recently founded of the 15 largest fraternities. Lambda Chi Alpha is an international fraternity, with chapters in Canada. 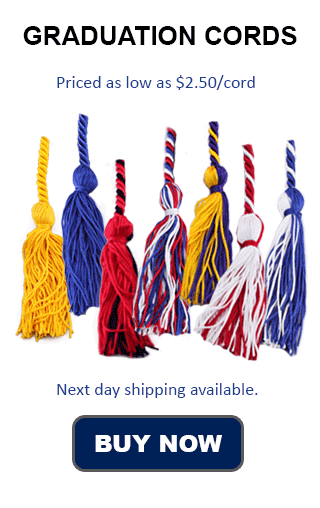 Honors Graduation has International Shipping as an option, and can	ship Lambda Chi Alpha Honor Cords to anywhere in the U.S. or Canada. The Fraternity has long taken a stance against hazing. It first formally condemned the practice in an Interfraternity Conference in 1928. Lambda Chi Alpha was also instrumental in setting up the Greek Anti-Hazing Hotline, which can be reached at 888 NOT HAZE. Lambda Chi Alpha's good deeds continue in the form of its philanthropic pursuits. In 1993 they founded the North American Food Drive. Since then they have collected and donated tens of millions of pounds of food, and the charity has grown to collect two million plus pounds of food each year for those in need. Lambda Chi Alpha Chapters include chapters at the following Universities and Colleges: Butler, Northwestern, Oregon State, the University of Alabama, Akron and Vanderbilt just to name a few.